Over 800 Items on Sale Now! We have just added over 800 items on sale at Trainz now to help you stretch your train budget dollars. You can either click on the sale banner on the homepage, or just enter the word "sale" into the search box. That will them sort out all our sale items by manufacturer, category, sub-category, and price. We hope you enjoy the hunt and find some great bargains. This will be a regular feature of Trainz. New Search Functionality - Whenever you search for anything, our new search results pages serve you up not only what matched your search, but items that are close matches, and it displays them in the most relevant order. Also the search results are sorted by Manufacturer, by Era & Scale (O-Postwar) , then by sub-category (Freight Cars) within each scale, and by price range. All of these can be used in combination with each other to filter out exactly the results you may wish to see. You can also sort results in these filters by popularity, price, an how recently we added them. Most Popular & Recently Added - On the home page we now have the top ten most popular, and most recently added items by era/scale. Since we usually add over 200 items/day this will provide you with a very easy way to see what we have added in your favorite scale and also to see which items has been viewed the most. Faster Checkout & Personalized Account Access - Now you elect to create an account for yourself and log in quickly with your user name and password. Here you also have access to view order status, shipping tracking information and past orders. Free Informative Articles - Click on the newsboy icon and let us know what scales you are interested in the future we will only notify you of interesting information in those scales. We are still building out this process. You will also get access to 19 different articles that we have written about toy trains, from collecting MPC Era reefers to our guide to using Fastrack and building scenery. Shipping Pricing - We have also implemented a new method of calculating your shipping charges based on the total weight and dimensions of your order. Once you look up the price of any item by entering your location with zip code, then every item will be priced when you look them up. As you add more items, shipping charges will be recalculated based on all your items. We believe you will find this much better matched to your combined orders than our previous method. International, Alaska, Hawaii, next day and second day shipping are all now automatically calculated for you - you no longer need to email us for shipping costs. Extended Hours Phone Sales Support - We have also concurrently implemented a network of train knowledgeable sales people to help you find what you need and to provide you with train expertise. Look for the blue "I'm Available" icon to be lit up on the homepage, which tells you we have at least one agent logged in. We have a quite a bit more on the way including recommendations and product reviews. Stay tuned. Well Lionel has pulled off a nice marketing deal with Wal-Mart. Here is what I saw in the Findlay, OH Wal-Mart yesterday right in the front of the store in the jewelery department. Milinda noticed it as soon as we walked in the door. They are pushing the battery powered sets hard, but they did have a couple basic O Gauge sets for $175. They also had Lionel Tee-Shirts, backpacks, the new DVD movie and some other stuff. Let's hope this will help get the next generation of Lionel enthusiasts stoked! 1200+ G Scale Collection Just In! If you are a G Scale Collector or Operator, you will love this! We just picked up an enormous collection with a huge emphasis on USA Trains reefers. There must be over 90% of every single reefer that USA Trains has ever made in this collection! We will be listing these both on our website and eBay over the next couple weeks. They are now loaded up in our wish-list database, so you can go to our wish-list page and enter the model numbers (without the preceding R in the model number), or just enter a keyword (like Sun Maid) and then add it it to your wish list. As soon as we list them, you will get an email with a link to them. You can also now easily keep up with us using the handy new inventory windows on our homepage, just click G Scale to see the most popular items and the most recently added 10 items. Then by clicking on the "See All G Scale Trains" link you will see all of our G Scale Inventory sorted by the ones we have most recently added, or however else you might want to sort or search for them as well. Enjoy! If you are new to model trains or know of someone shopping around for a train set, the Area 51 set is fun, different, and full of neat features. The engine is the reliable 0-8-0 design and the cars all provide additional excitement to the set. The tank car has a liquid load, and the goo inside the car swirls around as it goes around the track. If you are looking for something other than a basic freight or passenger train, this could be the set for you. It even includes six alien figures. To read more about the set, just click here. To see the full list of Lionel starter sets available at Trainz, click here. We are pleased to announce that Trainz now carries Williams by Bachmann. 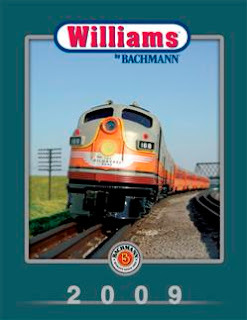 Just search 'Williams' on our site or click the banner to see our current inventory or Williams by Bachmann products. For those who are not familiar with the name, Williams Electric Trains were a staple of the 3-rail world for 30 years before being purchased by Bachmann in 2008. Williams makes both reproductions of classic Postwar-Era Lionel trains as well as its own designs in a seemingly endless variety of roadnames and colors. Technologically, Williams engines are about the equivalent of Lionel's Conventional Classics. Williams engines have a nice whistle and bell sound but do not have the complications of command control . They are great pullers and reliable performers. If you are a traditional O Gauger who prefers running trains straight from the handles of the ZW, Williams trains are right down your alley. Plus, the prices are great. Williams makes the popular Union Pacific 'Heritage' SD90 Diesels, and we have them for just $159.99. We plan to add to our Williams offerings in the coming weeks and months. In the meantime, check out what we have now--you may find a great deal! We are planning to set up a display at the upcoming World's Greatest Hobby show in Washington, DC [well, Chantilly, Virginia, to be exact]. The show will be at the Dulles Expo Center in Chantilly on January 23rd and 24th. For those who have never attended a World's Greatest Hobby show, I strongly encourage you to make an effort to check it out. The WGH shows are fun for both serious hobbyists and those who have never been around trains and are packed with operating displays and rides for the kids. Also, major manufacturers like Lionel and MTH are usually there as well. It's a great introduction to the hobby. If you have a friend who might be interested in model trains, bring them along. I attended the show in Atlanta a few years ago and was impressed by the sheer size of the crowd. There are only a few WGH shows a year, and we are planning to set up at this show and other WGH shows in the South, Midwest and East Coast in the future. eBay is having collectible event sales this season and Tommy here has been working with the eBay folks for the one about model trains. You should see it on the eBay homepage, but if you don't, here is the link directly to it. We have about a dozen starter sets in 4 scales as well as some really nice postwar trains that will be ending tomorrow night. Check it out! Big news today in the financial world is that Warren Buffet's Berkshire Hathaway has purchased the remaining 76% of BNSF that he did not already own for the tidy sum of $26 Billion Dollars. 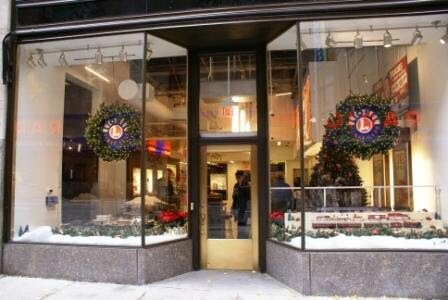 Liz Claman at Fox news learned that his house has a 3rd floor full of Lionel Trains. He stated all the reasons the deal made financial sense like: as the economy recovers more goods will be shipped on trains, trains are four times more fuel efficient than trucks, the barriers to entry are very high, a great management team is already in place, etc., etc. He denied that collecting Lionel Trains had any impact on his decision to buy the BNSF collection. That however sounds very doubtful to me! There are also several other videos of the new Lionel products as presented by Lionel manangement that you can view by changing the "2" in the URL above to 1 through 8 or so. For more information on the TCA organization see http://www.traincollectors.org/ . Scott at Trainz has been a member since 1975 and will be happy to help you become a member of the TCA. Please contact me at scott@trainz.com for more information.